Announcement Natural Handmade Soaps, Body Butters, Solid Perfumes, Sugar Scrubs, Bath Bombs made with Essential Oils, Absolutes, and Top Quality Phthalate Free Fragrance Oils. We never test on animals. ZAJA Natural is based in Johns Creek, GA and we have been making bath and body products professionally for over 10 years, and blending scents for over 20 years. We accept Etsy's Direct Checkout, which allows you to use any major credit card to pay for your purchase. We also accept Paypal. If you need a custom listing for any item, please send a convo and a listing will be created for you. Check back often since we list new items weekly! Natural Handmade Soaps, Body Butters, Solid Perfumes, Sugar Scrubs, Bath Bombs made with Essential Oils, Absolutes, and Top Quality Phthalate Free Fragrance Oils. We never test on animals. ZAJA Natural is based in Johns Creek, GA and we have been making bath and body products professionally for over 10 years, and blending scents for over 20 years. Have ordered from her on and off thru the years. Always top quality. This is my new go to perfume, so cozy and different! Beautifully blended and unusual. Shipped quickly and securely. After almost 11 years together and 2 kids, we finally got married on July 14th, 2012. Easy to use perfume droppers. Some herbs used in our soap, hand blended. Our company was created over 10 years ago. As you can see, the name ZAJA comes from the first 2 letters of our names. We find it quite catchy and it's easy to remember! In pursuit of the perfect bath and body care for our family, we soon realized there was not much out there at the time as far as handmade products. 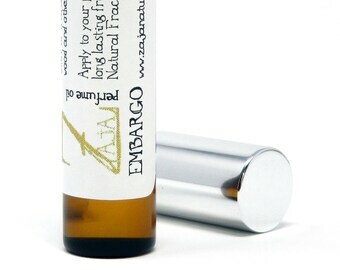 After many months of research and development we launched ZAJA Natural. This company strives to bring consumers handmade bath and body products that are free of harsh chemicals and animal products. Here you will find hefty bars of soap made with fine ingredients, botanicals, and butters; raw unrefined shea butter that will soothe and soften your skin; and a wide variety of perfumes. Bookmark our shop, like us on Facebook, and please visit us again! I am Zaidat, and I created ZAJA Natural 10 years ago after a life-long battle with sensitive skin. After trying to find the perfect product, I decided to just create my own. Luckily I had a very supportive partner who helped along the way. I am Jamin, Zaidat's husband and co-owner of ZAJA Natural. I am also an Airman in the United States Air Force. Around here, I measure the oils and butters, cut the bars, stamp them, and package them. I am Z's right hand man. ZAJA Natural Handmade Confections is a 2 person company ran by Zaidat & Jamin. We have been making soap for over 10 years, and Zaidat has been scent blending for over 20 years. Our skin care line is made with natural ingredients using tried and tested recipes that we formulate ourselves. And so much more. Be sure to bookmark our Etsy store. Please check out our beer soap line at http://thebeersoapcompany.etsy.com, the perfect gift for that special guy in your life! If you have any problem with your items, please contact us so that we can work things out. We accept Etsy Checkout as our main payment option. We do not accept Paypal. We do collect 6.5% sales tax from our Georgia patrons. Normal processing time is 1-3 days, but please allow 5-7 working days for your order to be processed and shipped, especially during the holiday season. If you would like your item to ship with UPS instead of USPS, please let us know so we can arrange the costs with you. Please feel free to make a custom request, we are open to all possibilities! We also offer wholesale so please contact us for details. Sorry no trades, consignments, or Net15/Net30 available. For press information please email us at info [!at] zajanatural.com or call us at 770-813-8577.